Yesterday was Thursday and that means a few things in my life. It means my son Svit will spend the day with his grandparents. It also means I will drive him to their place and work from a nearby cafe. On the beach. Yessss, I love my Thursdays because they guarantee me contact with the wind of a Dutch sea beach. Plus, a marvellous coffee and working by an open fireplace. Yummm! And yet yesterday, my Thursday started with a surprise. Around 10h everything in me started shaking. I burst into tears while talking to my parents in law. The tears were a mix of relief and of the intensity of a certain type of tension that has been piling up in me for years. Today, I want to share my story about how this tension came about, what did it do to my life and what will I do about it. And yes, it’s a very vulnerable story. The longer version of the story starts with me deciding to become an entrepreneur. Where I had to learn about skills I have never imagined I would need for my business to succeed. About skills and mindsets, I was never taught about in any school I ever went to. The last one on that list implies you know what you are worth, that you stand up for it, and ask for it. This has been the biggest journey for me as a female entrepreneur. Now, the funny coincidence is that I met my partner at the same time I started my company. And to make it even stranger, he started his the same year. So, imagine a household of 2 entrepreneurs who went through the exact same initial hiccups and learnings at the same time. For five years. It was exciting and scary. We were having conversations like: What have you discovered about yourself today? Will we make it through the month? Will we be able to do anything fun? Ever again? Is the myth about starving entrepreneurs really true? There were moments when we both wanted to stop. Four years down the line, my partner decided to do just that. He was exhausted by all the NOs. He longed for personal and professional growth, for the possibility to make a real impact with his work. Yet the scope of his company didn’t allow him to do the innovation he wanted to bring to the market. Any of this sounds familiar? This is when the shorter version of this story starts - when he decided to close his company and look for a job that would fit who he truly is. That would incorporate his passions, desires, type of personality he brings with him, his playfulness and his feel for people. This was a year ago, to be exact. To make it juicier, he started his career change process just as our son was born. No small task, juggling a newborn, figuring out what means to be a family and how to redefine your career. He went for it and I supported him as much as I could in between the breastfeeding, diaper changing and dealing with my after birth hormones. His family and friends supported his decision as well. And yet, it took him 1 whole year to find a place where he feels at home. Today is the first week he has a job that challenges him the right way. Yesterday was the first Thursday that I enjoyed my 'beach office' on my own and he his in Amsterdam, excited about the project he will first dive into (I just read his message about it:). Now, where is this going, you might ask? Well, as I was standing in the kitchen of my parents in law with tears trickling over my cheeks, I a really intense period has finally come to an end. Doooh, you might say. Wasn’t that obvious? Yes and no. Rationally, I knew it from the moment he got a Yes, we want you in our company. But everything in me was still living the consequences of the fear that creeps into your deepest pores if you live with that level of insecurity for too long. The same fear made it difficult to dream, to breathe freely, to trust that everything will be ok. I realized I was still in the “must work, must provide, must work, must provide” mode that made it difficult to relax in what I was doing on a daily basis. Difficult to slow down. To allow for things to emerge, instead of pushing for them. Can you relate? And yet, I feel extremely grateful for my morning Dingdong! moment. I cherish it because it gives me the opportunity to do something about my situation. The awareness brings me back the power over this part of my life. At this point, I invite you to think along - what transition are you in right now? What can you consciously close to embrace the new? A transition from finishing a study to starting a job? From caring for your baby full time to going back to work? From burning out to feeling fit to change the way you work? From thinking about changing your career to deciding to go for the change fully? … From looking for a job to starting it? I believe we, as a society, wildly underestimate the power of such transitions. We rush from one story to the other. With almost no breathing time in between. 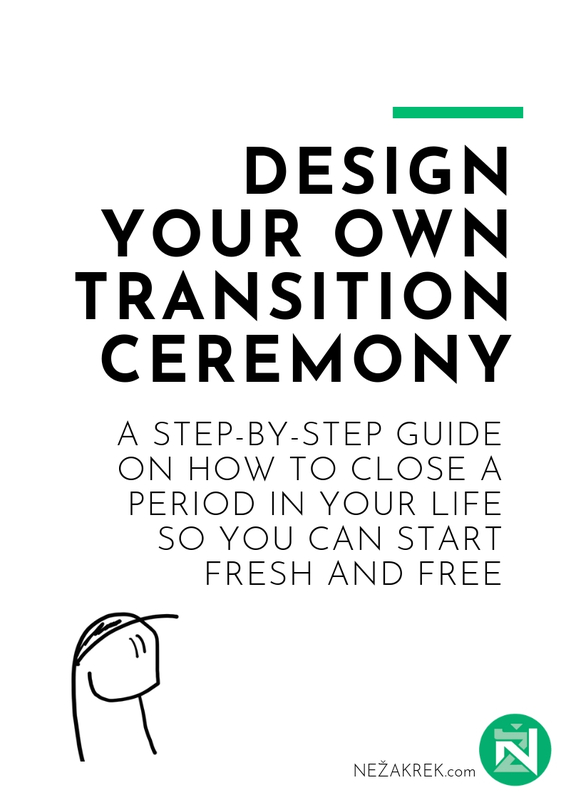 A very healthy way to close one period and open another one is to create a transition ceremony. I will create one for myself this weekend. And by a ceremony, I don’t mean jumping like a madwoman around a fire in the wintery wilderness. Not unless that is exactly what you need to close the chapter you are saying goodbye to. By creating a ceremony I mean dedicating time and space for thinking through what are you saying goodbye to. And to allow for whatever emotions might spring up in the process. You want to enter the free resources library and grab one of the practical Party Papers? Sure thing! Leave your name and email and I'll send you the sssecret password straight away.